Dominion Earnings: Is This Natural Gas Stock Headed Higher? Dominion reported earnings last Thursday, underwhelming investors for Q1 2013. Stormy weather, service outages, and shrinking demand put a damper on its earnings, but a gas-centic strategy could keep Dominion pulling profits for years to come. Let's see if this natural gas stock has what it takes to earn a place in your portfolio. Dominion raked in $3.52 billion in revenue for Q1 2013, matching 2012's first quarter but missing analyst estimates of 1.5% growth. The bottom-line numbers look slightly worse, with $0.83 EPS falling 2.4% below Mr. Market's earnings expectations. 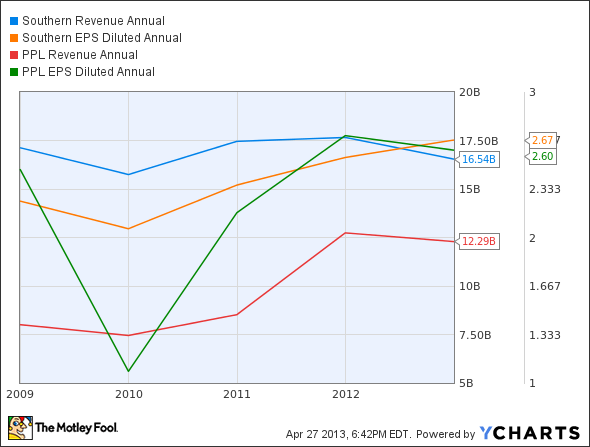 These newest numbers are also $0.02 below Q1 2012's earnings, and a full $0.10 below 2011's first-quarter EPS. 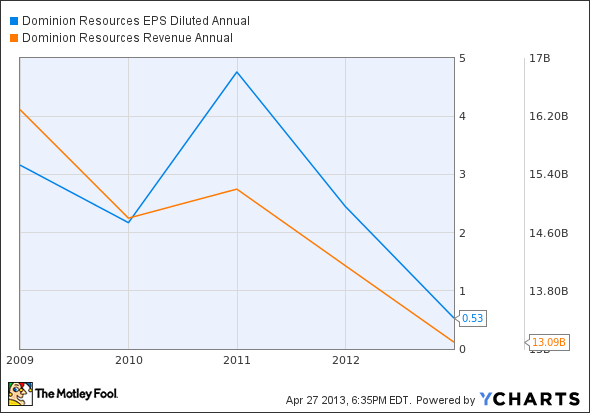 Since 2008, sales have fallen nearly 20%, while diluted EPS is down 83%. Southern, a slightly larger company, has seen sales drop 3% while diluted EPS headed 19% higher. PP&L , a slightly smaller utility than Dominion, has managed to boost revenue over 50%, but diluted EPS is just 5% above its 2008 level. SO Revenue Annual data by YCharts. Did Dominion just get dominated? There's no beating around the bush: Q1 was not nice to Dominion. One-time negatives like storm restoration costs and a delayed in-service date of a natural gas processing plant might not be long-term worries, but there are two key components that investors need to keep an eye on in the quarters to come. First: falling sales. Although this is a common trend across all utilities, Dominion relies on regulated electricity sales for 50% of its revenue, a significant chunk of its profit pie. Regulated utilities offer some of the steadiest rates of return on the stock market, but overall sales still slump if customers use less energy. Ameren is currently cutting out its merchant generation business entirely, a move that could keep its profits in the pits if electricity use doesn't pick up. The second indicator of this natural gas stock's future is (of course) natural gas. Not only does the utility use natural gas for 17% of its generation capacity, but its Dominion Energy subsidiary is also busy making the most of midstream margins. Q1 EBIT clocked in at $301 million, well above Dominion's estimated $255 million to $285 million range. Dominion is a unique natural gas play, since the company is selling, transporting, and using natural gas. Its Blue Racer midstream joint venture offers a rare opportunity for vertical investment, potentially boosting sales as a result of pricier natural gas. However, any longer-term price increase could have a negative effect on demand, reducing overall natural gas consumption. To globalize its price risk, Dominion is busy expanding its LNG export options, lobbying Congress, and creating 20-year agreements with Indian and Japanese corporations. TECO Energy is to coal stock as Dominion is to natural gas stock, with coal-centric capacity (61%) and mines in Kentucky, Tennessee, and Virginia. Rising natural gas prices are expected to increase coal demand by 7.8% for 2013, but a lack of modernization could leave TECO shareholders hung out to dry if coal becomes cost-ineffective a second time around. Exelon offers what neither Dominion nor TECO can: diversity and cost effectiveness. Rising natural gas prices are putting nuclear back in the competition, and the utility's capital expenditures are keeping its overall operations up to par with its peers. Dominion's shares barely budged last week, despite misses on sales and EPS. Short-term costs pushed the utility's earnings down, but the long-term outlook remains much the same. Dominion bulls are betting big on this natural gas stock, but investors will need to watch prices and policy closely as domestic competitiveness and export possibilities play out over the next year. As natural gas prices head higher and the nation moves increasingly toward clean energy, Exelon is perfectly positioned to capitalize on having the largest nuclear fleet in North America. This strength, combined with an increased focus on balance sheet health and its recent merger with Constellation, places Exelon and its resized dividend on a short list of the top utilities. To determine if Exelon is a good long-term fit for your portfolio, you're invited to check out The Motley Fool's premium research report on the company. Simply click here now for instant access. The article Dominion Earnings: Is This Natural Gas Stock Headed Higher? originally appeared on Fool.com. Motley Fool contributor Justin Loiseau has no position in any stocks mentioned, but he does use electricity. You can follow him on Twitter, @TMFJLo, and on Motley Fool CAPS, @TMFJLo.The Motley Fool recommends Dominion Resources, Exelon, and Southern. Try any of our Foolish newsletter services free for 30 days. We Fools don't all hold the same opinions, but we all believe that considering a diverse range of insights makes us better investors. The Motley Fool has a disclosure policy.